Virginia Woolf has been the subject of many books, plays and films. She was a gifted writer who nurtured progressive thoughts in her own day, but it is more her inner turmoil that continues to intrigue us now. Elizabeth Wright’s play, adapted from a novel by Susan Sellers, examines Virginia’s relationship with her older sister Vanessa Bell, herself a painter of considerable note. Both were members of the influential Bloomsbury Group. It is produced by Moving Stories, a company founded in 2010 by Emma Gersch, who is the play’s director. As played by Kitty Randle, Vanessa is the more practical of the two, loving and protective of her sister, but capable of misguided jealousy. Alice Frankham’s Virginia is, at times, childishly capricious, aware and boastful of her writing talent but, at other times, stricken by depression. The sisters are bound together inextricably but they cannot connect fully with each other and they are never in complete harmony. Vanessa paints a portrait of Virginia and notices that the expression on her face is blank; she then realises that this is how she actually sees her. The events in the play span some 50 years from the sisters’ childhood to late middle age and they encompass three wars, many family bereavements, marriage, and mental illness. Vanessa has an open marriage but is tormented by her lovers’ infidelities, whilst Virginia laments that her mental health bars her from motherhood and restricts her freedom. The two characters appear in scenes together and reading correspondence to each other when they are apart. Other characters are referred to frequently but they never appear, many events are described but not enacted. This gives the advantage of ensuring that the focus stays firmly on the sisters, but it also imposes a structure which limits the play’s dramatic impact. When the sisters are together, there is chemistry that yields real tension, but when they are apart, there is no drama, just words and it stretches the considerable talents of these actors to hold the attention of the audience at these times. Kate Unwin’s set uses pastel coloured curtains as a backdrop and creates a Bohemian feel with beads, parasols and assorted trinkets overhanging the stage and the audience. Jeremy Thurlow’s piano music complements the play, being melodic but unobtrusive. This is an accomplished production of a play that provides an interesting and, for the most part, absorbing insight into two fascinating lives. Staged by the Huddersfield based Dark Horse company, a leading vocational trainer of actors with learning disabilities, this new family comedy with music is written by Vanessa Brooks. The family in question is a single mother with two grown sons; the older, Kit, faces a career crisis and the younger, Spencer, has learning disability and defines himself by his inability to sing. The family is extended by a neighbour, Bonnie, who is infatuated with Kit and dedicated to her mission of teaching Spencer to sing. The play centres on Spencer, who is on stage almost throughout, staying calm and rational as he observes the others tackling the crises in their lives. His life is depicted as much simpler than the others and we see the story unfold through his eyes as he strives to achieve his personal goal of singing in a talent contest at the Royal Albert Hall, judged by Amanda Holden. Spencer is played by Joe Sproulle who (we are told) himself has learning difficulties. He exudes charm and he certainly knows how to work an audience. He also has superb comic timing and generally gives a confident, very professional performance, showing no signs of buckling under the pressure of this huge role. The three non-learning disabled actors, Alwyne Taylor, Heather Dutton and Richard Maxted, provide excellent support. The set is colourful and brightly lit, whilst a back screen shows old photographs and amusing computer-generated images. The title is drawn from that of the hit radio programme of the 50s and 60s, and tunes of the sing-along variety from that era and earlier provide the music for the show. The songs are simple and so too is the script, never challenging the audience even though the production often challenges our preconceptions. However, simplicity is its greatest asset as it serves to remind us how we all tend to make our lives much more complicated than they need to be. This show is warm and joyful, a real pleasure. This production originated in Leeds, so staging it within a mile of Shepherd’s Bush really is the equivalent of taking coal to Newcastle. The show consists of four episodes from the tv series, embelished with some rather weird dance routines to 60s pop songs. Some considerable effort seems to have been put into it, the set is admirable whilst Mike Shepherd as Albert and Dean Nolan as Harold are both true to the originals, without resorting to outright impersonations. However, it all seemed pointless and completely unfunny to the extent that it became difficult to understand why the tv show was ever a success. Maybe it is just the passage of time that has made scripts that were once thought brilliant come across as so feeble. Or maybe it only ever worked because of the chemistry between the tv actors. In any event, I could not connect with it on any level and left at the interval. For the sake of those who stayed, I hope that the second half was better. In 1931, Peter Llewelyn Davies, in his mid-30s, met an 80 year old Alice Hargreaves (nee Liddell). Both were soured and disillusioned by tragedies in their lives, but they had one other thing in common. As children, they had been the inspirations for great fictional characters, Peter Pan and Alice in Wonderland. Drawing from this real life meeting, John Logan’s achingly beautiful new play expounds on the themes of adulthood and childhood, ageing and staying forever young, reality and fantasy. 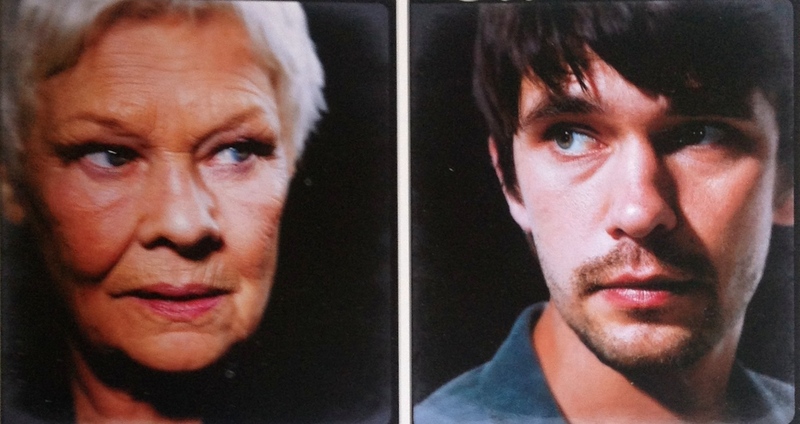 The two leading roles seem as if they could have been written for Ben Wishaw and Judi Dench, both are so perfect and so utterly magnificent. In flashback sequences, Derek Riddell (as JM Barrie) and Nicholas Farrell (as Lewis Carroll) are also excellent. Michael Grandage’s production is slick, the sets find Neverland in an Edwardian theatre and Wonderland in a vast library. It is an evening of superb writing, wonderful acting and visual splendour. West End theatre does not get much better than this. On the surface, this American play by David Auburn is written to the template for the perfect Broadway hit; two hours long, one set, four actors, slightly intellectual but not too challenging, dashes of romance and sentimentality, etc, etc. In fact, it is in many ways much too perfect, being so neatly structured that it reaches the point where it feels too contrived to ever be really convincing. Dealing with a woman who inherits a genius in Mathematics from her father who had also suffered from mental illness, it is nowhere near as clever as it seems to think it is. That said, this is a fairly solid production which includes an electrifying performance from Mariah Gale. So the evening is gripping and entertaining while it lasts but there is not much to think about afterwards. Like a chocolate souffle, tasty but lightweight. Neither tragic nor comic and only loosely a history play, this has become one of Shakespeare’s least performed works and it is more than a little surprising to find it above a pub with a cast of only five. The Pistachio Choice company has already staged Pericles and now turns to this as the second in its “lost and found” season, describing it as the Bard’s “most famous unknown play”. Set in what seems like a farm cottage, the production has a rural feel which suits the text. The plot concerns an ancient British King, Cymbeline whose daughter, Imogen has secretly married Posthumus, whilst his wicked Queen is plotting for her son by a former marriage, Cloten to accede to the throne. Tricked into believing that his wife has been unfaithful, Posthumus sets off for Wales, pursued by Imogen, and encounters Cymbeline’s two long lost sons. Similar to The Winter’s Tale, the play starts out as heavily dramatic but mellows considerably as it progresses. Inevitably each actor plays many roles, sometimes cross-dressing, using nothing more than changes of jackets, hats or accents to distinguish between them. With a plot that is more than a little convoluted, any struggle to recognise characters ought to have made the production utterly incomprehensible yet, strangely it has exactly the opposite effect and there is more clarity than might often have been achieved by a 30-strong company at, say, Stratford. There are even unexpected bonuses; when Imogen mistakes the dead body of Cloten for that of her missing husband, it is totally believable because both are played by the same actor. Once the audience has got over early problems with identification and embraced the actors’ swift character changes, it all becomes rather fun, to the point that an actor can be playing two characters in the same scene without impairing the impact of the drama. Very considerable acting skills are needed to pull all this off. Those responsible are: Ruth Rogers, Jerome Thompson, Caitlin Thorburn, Scott Wilson-Besgrove and Tim Wyatt. Shakespeare’s plays have survived for 400 years and are still providing entertainment and still proving relevant to modern life. This vibrant production exemplifies the benefits of re-imagining the plays and adapting them to new surroundings and lifestyles. They do not need to be seen only on the grandest stages with huge companies; pared down, as here, they are all about story-telling and glorious language, qualities that will be equally valued in another 400 years. At the end, Cymbeline looked rather a good play and it seemed curious that it should have become neglected. For Pistachio Choice, this is mission accomplished. This is the second show by the diminutive Hollywood character actor turned raconteur/stand-up comic, Leslie Jordan, following My Trip Down the Pink Carpet a couple of years ago. The evening begins with a 30-minute “warm-up” by The Supreme Fabulettes, a drag trio who treat the audience to renditions of 60s Motown classics with a little Amy Winehouse and Adele thrown in. This is passable and a drag routine is entirely compatible with what is to follow, but it is difficult to see why a supporting act was deemed necessary when Jordan’s 90 minutes on stage gives full value for money. The central character in this routine is Jordan’s mother (“do gay men really become their mothers?” he asks), as he tells of his early life in Chattanooga, Tennessee and the outrageous excesses of his teenage years in the Deep South of America. An effeminate child and an openly gay young man, he was always at odds with the traditional values of the Bible Belt, but this is never a story of repression and discrimination. Jordan does not question or regret who he is, he simply accepts it, which makes the overall message totally positive and optimistic. It is also very, very funny. Jordan’s style is relaxed and self-deprecating, he strides from one side of the stage to the other, rarely standing still, a small bundle of mischief, naughty but nice. Using old family photographs as points of reference, he sometimes appears uncertain as to the extent to which he has embellished his stories, but it becomes clear that this is an actor who has learned his lines well and any apparent lapses in concentration are in fact well rehearsed. The show is full of the expected camp one-liners and acid observations, but what sets it apart from and above most others of its kind is that it has real heart and warmth. A treat.